I have long marvelled about how quickly the world of mobile phones has rapidly moved through four paradigms. My first mobile phone was a Nokia and they seemed to rule. But then Blackberry won because Nokia did not get the importance of email. And then Apple won because Blackberry did not look beyond email. And then Google Android seems to have won because Apple did not understand the problems of a closed system. At each stage, it looked like there was a dominant solution, but the pace of change was brutal and the king of the heap was rapidly unseated. What an amazing pace of creative destruction. 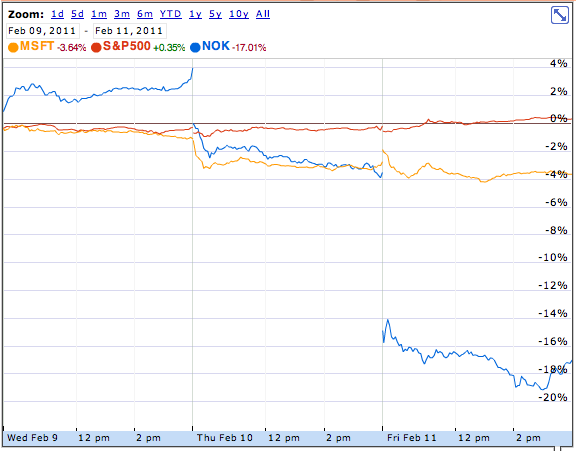 So the market seems to have knocked Nokia down by 18% for wanting to run with a loser like Microsoft. And what's more funny, the market seems to have knocked Microsoft down 4% for this contract too (which I don't understand - compared with being wasteland, it seems that it is good news for Microsoft to have the support of Nokia). Its so tempting to buy MSFT as this price!! Besides: Good Hardware+Good Software* =Win? Maybe. Maybe not. Only time will tell. * - Windows Phone is definitely better than Symbian. I'm not in favour of Google/Android due to their vague privacy policies and difficulty in implementing across various Nokia handsets. Besides, Elop used to work for MSFT, so chemistry is bound to be good between the two companies. I'd love to blame Microsoft too but the situation is more complicated. Look at this news snippets of the google finance snapshot . The triggers for the stock price crash could very well have been the announcement of layoffs or the company restructuring on the same day. It is hard to say. Had you considered these alternative explanations? The letter mentioned in the two comments above is here. I think I'm starting to see why the MSFT stock price fell. They are saying "we were desperate, we picked MSFT". It sounds like you have to be down on your luck to choose MSFT. These links apart, I feel MSFT is a bargain buy due to its strong balance sheet and cash flow (and cash in hand). The only question remains is whether the market is right or wrong in discounting its not-so-bright future. This is the call that an individual investor will need to make. It will be interesting though, to see how the Nokia partnership will pan out, in the face of competition from iOS and Android. MSFT is a decent buy if you are looking for a near-mid term dividend paying stock. But if that is what you want, why not buy an oil company or a utility? From a growth stock perspective (where you gains would be more from price appreciation), I do not see what will drive that. The only way that would happen is if MSFT is able to return revenue growth quarter after quarter starting with a large base where a product or sector hit or two will make little difference. Considering its biggest competitive advantage was network externalities which it does not have in the next big tech sectors of today (mobile, social media, etc) and that its existing markets are getting eroded due to migration to mobile devices and online applications, I see a big problem for them. It would be an achievement just to maintain revenues at existing levels. Triggers for the stock rates crash could very well have been the announcement of layoffs or the company restructuring on the same day.